Nortek Global HVAC Launches New 16 SEER Packaged Heat Pump. New 16 SEER Packaged Heat Pump. Model Q7RF boosts efficiency in a packaged product. 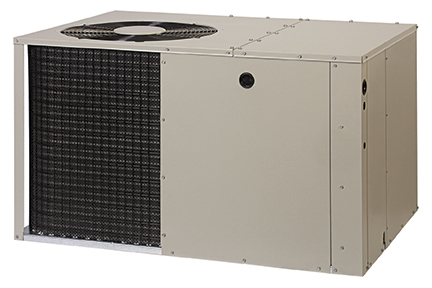 Nortek Global HVAC introduces a new 16 SEER, 12 EER, 8.2 HSPF ultra-high energy-efficient unit to its packaged heat pump line. Model Q7RF is a two-stage heat pump with all-aluminum Micro-Channel evaporator and condenser coils for lighter weight, smaller size, better durability and greater reliability in corrosive environments. The Q7RF single-packaged heat pump system features a small footprint for ease of installation. Micro-Channel coils contribute to the smaller size of the unit, offer better heat transfer for higher efficiency and use up to 30 percent less refrigerant than systems with traditional coils. Each unit features Nortek Global HVAC’s patented defrost process. Traditional tube-in-fin heat pumps have coil headers on the sides and defrost horizontally. But in a Micro-Channel heat pump, the coil is rotated 90 degrees so that the headers are on the top and bottom, not the sides. If the defrost started from the top down, the bottom of the coil would never defrost completely. The Nortek Global HVAC patented process adds a hot gas bypass so that hot gas goes from the top-down as well as the bottom-up, ensuring the entire coil gets defrosted. Model Q7RF is available in the Broan®, Frigidaire®, NuTone®, and Westinghouse® brands of HVAC equipment. Similar model PPH3RF is available in the Maytag® brand. They are ENERGY STAR compliant and available in 2, 3, 4 and 5 ton capacities. For more information about innovative Nortek Global HVAC products, contractors and distributors should visit www.nortekhvac.com. Trademarks Broan®, Frigidaire®, Maytag®, NuTone® and Westinghouse® used under license.